I'm calling this bike route "Not Highbury" because cyclists in London currently face a bit of a challenge moving from north to south or vice versa in the east end of the city. The west side too, I think, but I've had to deal with that less often, and so don't have an answer for it yet. Most of Highbury Ave is a scary waste of time for cycling. Here, for your viewing pleasure, is my favourite way of riding from North London to South London on the east end; not used is a great little route between Dundas and Oxford behind the London Psychiatric Hospital. There are cool abandoned buildings, a peaceful setting, the works. I think I might map that piece all by itself, it is very much worth riding and knowing about, but connections on either end of it are kind of clunky. This doesn't come very naturally, which is why I'm highlighting it. Now here's the route, from north to south. 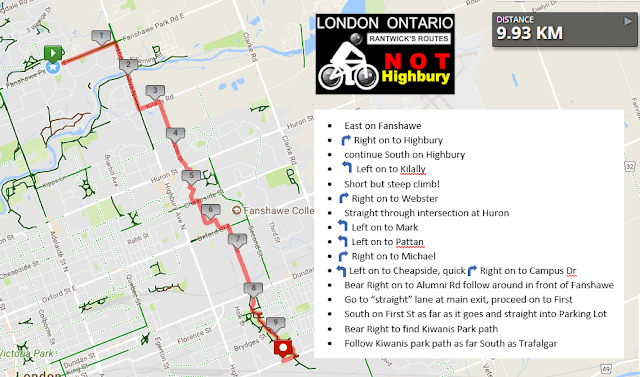 People can access this route from either the North Branch of the Thames Valley Parkway, or as recorded here, Fanshawe Park Road. I've noted where the TVP hits this route in the video. Hey, do you have a little-known or really useful route I should chronicle? Please contact me. I'll do the video and mapping work if you'll tell me where to ride. Of course I'll be happy to credit any contributors both here and on youtube, which will make you famous with like, 15 people maybe. I'm also interested in cataloging sweet little connecting bits that "nobody else" knows. Send them to me and I'll make them part of the info I'm trying to share and spread! Be very aware of wild turkeys, they are mean. Understood. I will not approach any wild turkeys unless I've got my Turkey Defense kit on.